A SHIRT STUD is a decorative fastener that fits onto a buttonhole on the front of a pleated shirt, or onto the starched bib of a stiff-front shirt. Such shirts have special buttonholes solely for shirt studs. 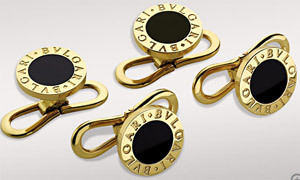 A shirt stud may be fashioned from alloys, precious metals, and gemstones—materials uncommon to buttons sewn on shirts. The stud may have an inlay, such as of pearl or onyx. Dress code of the modern western world reserves shirt studs for men's formal wear and some semi-formal occasions. In the western world, shirt studs were first used in the mid-19th century, when some shirt fronts were too stiff to close with buttons. So remains the case for the heavily starched, modern full dress shirts worn with white tie. Stow - "Leather Stud Box." Andy & Tuly - shirt studs & sets. 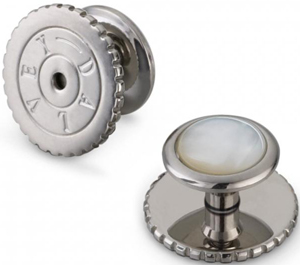 ASPINAL OF LONDON - dress shirt studs. BENSON & CLEGG - founded in 1937. 9 Piccadilly Arcade, London, U.K.
Budd - since 1910. Luxury Shirt Studs. CHARLES TYRWHITT - since 1986. Jermyn Street, London. 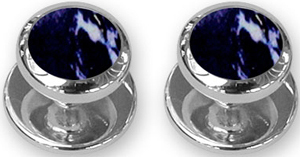 Mother-of-pearl & onyx tuxedo shirt studs. GUCCI - evening stud set. DENMAN & GODDARD - since 1797. Dress studs. SILVER GROVES - silver shirt studs. 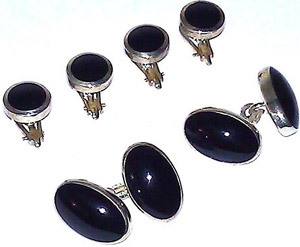 TATEOSSIAN - shirt stud sets. Tiffany & Co. - since 1837. "For the man of distinction." 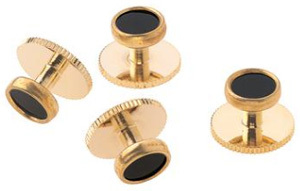 Tom Ford - gold stud sets.